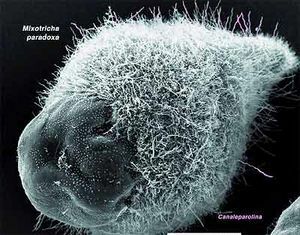 Briciole di Biologia --- Crumbs of Biology di Giovanna Rosati: Symbiosis and evolution: together we can!!! Symbiosis and evolution: together we can!!! Not always biological evolution is thrown by competition: in many cases it is based on cooperation. This statement is not in contrast with Darwin theory, but in some way represents an integration to it. Indeed the evolution of a species consists often in getting out from competition by the adaptation to a particular diet or to hard environments. Symbiosis in many cases is the key for these adaptations. In other words: together become possible what alone is impossible. Do you want examples? Here they are. In the following picture you can see an aphid, a plant louse, a little insect that often infest our plants, especially the youngest ones. Aphids bother us but, from a naturalistic point of view they are phenomenal: during evolution they managed to get a food very abundant in nature but not used by other animals. So they do not have competitors!! This food is the sap of vascular plants. Why this natural resource is little used as food? Because it contains only sugars, not proteins. So, as the majority of animals are not able to synthesize all aminoacids (the little molecules by which proteins are composed), a diet lacking proteins is not sufficient for their survival. Then, in which way solved aphids the problem? In return Aphids protect their symbionts and provide them with substances useful for their metabolism. This symbiotic relation is now obligate: the two organisms are not able to survive one without the other! Buchnera even transferred a great part of its genome in the host genome and probably uses nutrient supplies from the aphid host. Sometimes a symbiosis leads to another. On the plants infested by aphids often there are ants. Do you know why? The two insect species are engaged in a mutualistic symbiosis: ants farm aphids, protecting them on the plants they eat, eating the highly nutritious and sweet honeydew aphid release from the terminations of their alimentary canals ( in other words they eat aphid poo-poo). In return, the ants tenderly look after and protect them from predators. By stroking the back of some aphids with their antennae, the ants can induce a honeydew droplet. The ants may move the insects to areas on the plants with the best sap. When it rains they may move them to sheltered places, even sometimes into their own nests. an organic material very abundant in nature that, however, cannot be digested by the majority of animals. Anyway, a few species acquired, during evolution, this capability. Amomg them Termites deserve particolar mention. They represent an order (isoptera) of xilophagous insects known for their complex social organization but also for the damages they cause in human settlements. Consider that the termite damages in USA are calculated around one billion dollars every year. 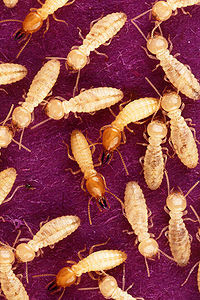 On the other hand termites have a relevant ecological role as they eat almost one third of plant production every year. But how did termites succeed in digesting wood? They host symbionts which assist in the breakdown of cellulose in their digestive apparatus. It is very complex symbiotic community consisting of prokaryotic and eukaryotic microorganisms in turn often associated in symbiotic relationshipsamong them. For example the giant flagellatum Mixotricha paradoxa (about 500 micrometers long) harbors on its membrane at least three different types of spirochetes. These filiform bacteria form a sort of fringe on the host surface, and beating all together allow the sleeping of their host among the cells of the termite gut. Termites are not the only animals in which edosymbionts are essential for a good digestion. The situation in all herbivorous is similar to that in termites. Even we, human beings, host the so called intestinal flora i.e. a complex community of microorganisms in our intestinal apparatus. Do you want exempla of extreme habitats colonization? Eucaryotic cell metabolism (that is the sum of chemical processes that take place within the cell itself) is based on oxygen. On the other hand there are on the earth a lot of wide an diversified anaerobic environments. For example the deepest layers of marine an fresh water sediments. Moreover in fresh water habitats oxygen may be lacking even in the deep water column, at least in some seasons. But these environments harbour abundant and diversified life forms. Indeed many prokaryotes do not need oxygen and find there their perfect habitat. Consider that sediments contain the organic material produced by all the organisms living in the overlooking water: poo-poo and pee, secretions and corps. It is a sheer bliss for bacteria!!! This bacteria production would be confined to the sediments without anaerobic protists that eat bacteria and are in turn eaten by other protists living in the upper levels where oxygen is present. The latter are food for little animals and so on. There are indeed eukaryotes living in anaerobic habitats? Yes thank to a symbiotic event. All anaerobic eukaryotes (besides protists there are some fungi) do not possess mitochondria (cellular respiratory organelles) but possess other organelles of symbiotic origin (on the other end mitochondria too where acquired by symbiosis). These organelles are different from each other and from mitochondria: they have been probably acquired in different ways and in different times to render their hosts able to survive without oxygen. Anyway all started with a symbiotic event!!! But once again a symbiosis is linked to another. The majority of anaerobic protists host methanogenic bacteria (i.e. bacteria that produce methane). These bacteria utilize for their metabolism hydrogen accumulated into hydrogenosomes, (the most common of the organelles mentioned above) enhancing in this way the metabolic efficiency of the host. Perhaps it is useful to remember that methane formula is CH4 (C= carbonium and H = hydrogen) so for methanogenic bacteria is very convenient to have a hydrogen reservoir at their disposal. Let’s go now in the deep sea where light is completely lacking and photosynthesis is impossible. There is life there? Yes! Complex communities can be found at least around hydrothermal vents. These communities are one of the few ecosystems on the planet that do not rely upon sunlight for their energy supply. Chemosynthetic bacteria, i.e. bacteria using the sulfur inorganic compounds coming from the vents for their metabolism, are the energy source. Animals feed directly or indirectly on these bacteria. In the Galapagos region primary production at the hydrothermal vents level is 2-3 times higher than that resulting by photosynthesis in the upper region where sun light arrives. And what has symbiosis to do with the life in this extremely particular habitat?? The following are two examples, both based on symbiosis, of different ways taken up by animals living there. The first one concerns Riftia pachypila, a huge worm (included in anellida oligochaeta) forming large groups on substrates, especially basaltic ones. Riftia possess a long, thin tube made of chitin and scleroproteins, up to 1.5 m long, covering the fleshy body. Sort of “ feathers”, showy red-orange colored, can be extruded from the tube. Riftia doesn’t have neither a mouth nor a digestive tract. It contains instead a trophosome , a sort of sack containing a lot of Chemosynthetic sulfur oxidizing bacteria i.e. bacteria which, for their metabolism, need sulfur and oxygen. The latter two gas, however, tend to be mutually exclusive as sulfides spontaneously oxidize. But Riftia provides both elements to their symbionts! Indeed this worm possess two types of emoglobin: the first one binds oxygen (like the emoglobin in our blood) while the other binds sulfide. In this way trough the circulatory system bacteria, on which adult worms depend for sustenance, are….served. 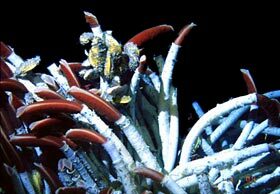 Then, very near to the hydrothermal vents, where temperature is very high, lives Alvinella pompejana, the Pompeii worm, considered one of the most heat-tolerant animals on earth as it bears up to 90 C°. Differently from Riftia, Alvinella is equipped with mouth and digestive tract and does not host symbionts inside. Their back however is covered by bacteria. Living in a symbiotic relationship, the worms secrete mucus from tiny glands on their backs to feed the bacteria, and in return, they are protected by some degree of insulation. The bacteria have also been discovered to be chemolithotrophic, contributing to the ecology of the vent community. Did you notice that in all the symbiotic relationships I have referred microorganisms (prokaryotes or eukaryotes) are involved? Thanks to the USA scientist Lynn Margulis, unfortunately recently dead, the relevant role played by microorganisms in evolution and life maintenance is now recognized at every level. Even we, human beings, that consider ourselves higher organisms, depend on symbiotic bacteria. Consider for example the so called bacterial flora comprising a lot of different microorganism species able to decompose materials like cartilage an cellulose that our enzymes cannot digest. Moreover these bacteria synthesize vital substances like K vitamin, important for blood coagulation.